Whether you’re using oils for aromatherapy, mixing your favorite scents into homemade cleaning products, or freshening up the smell of your room, oils can be very useful. When you use essential oils, it’s important to ensure that you have all of the supplies you need so that you can store, mix, and use your oils properly. That’s why it’s important to make sure you have the right bottles for your oils. 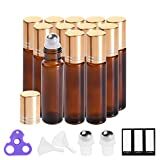 Why are essential oil bottles important? How much oil will you be using? How will you be using your essential oils? What environment will your oils be in? When you use oils, it’s important to make sure your oils are appropriately stored, so you can get the full benefits from them. When you purchase bottles for storing your oils, they need to be the right types of bottles for your oils and the way you will use the oils. Oils have to be protected from environmental factors. The containers in which they are placed are essential for protection from those elements. In order to make sure you have the right vials for your oils, there are a few things you should think about. These considerations can help ensure that the bottles you use for oils protect your oils and meet your needs for using your oils. This question can help you pick the right size bottle for your essential oils. If you use a lot of essential oils, you may want to invest in larger bottle sizes to keep from refilling the bottles frequently. The way you use your essential oils can determine the type of bottle you need. There are vials with screw tops, sprayers, and rollers available. Since essential oils need to be protected from light, moisture, heat and air, it’s important that the containers you choose protect the oils from the environment. For example, if you live in a humid climate, protecting against moisture will be more critical. There are a lot of different vials available for your essential oils. But not all bottles are equal. When you’re shopping for vials, there are a few things to look for so you can make sure you get what you need. What material are the bottles made of? How do the bottles seal? 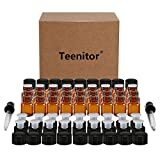 What are the expected uses of the vials? Once you purchase bottles for your essential oils, they can be reused as often as you want. Only add more of your favorite oil to the vials when it is low or empty. However, if you decide to change the oil in the bottles from what was in it previously, you will need to clean your containers. Soak the empty bottle in warm water for five minutes. If there is a label on your container to remove, use a few drops of lemon oil to remove the sticky residue from the label. Place the vial in a separate bowl of warm water with a small amount of Thieves Household Cleaner to remove any remaining oil. Let all components of the container, including the lid, air dry completely. Refill it with the essential oil of your choice. This product set by Bulk Essentials come in a set of 12 individual vials. Each bottle can hold 10 mL of essential oils. The containers are designed to be reused and refilled with oils multiple times. The tops can be fitted with roller balls for easy use of oil mixtures. The bottles are intended to seal tightly with screw top lids to prevent oils from leaking, and the amber-colored containers protect the oils from the damaging effects of light during storage. Spray top containers in 16-oz size are designed for use with mixtures, such as homemade cleaning products or room freshener mixtures. The amber-colored glass vials protect against the damage of light during storage. The spray top is designed to be comfortable in hand. The size of the bottle is large enough for daily use without frequent refilling but small enough for easy storage. Included labels can be used to designate specific uses for each bottle. This set of 36 sample-size (2 mL) vials are perfect for carrying oils when on the go. The amber-colored bottles protect against damage from the light. Screw tops are designed to prevent leakage, while the orifice reducers are designed to dispense single drops at a time when mixing oils for use. The glass containers are designed to be used over and over. These oil roller containers by PrettyCare are designed for use with mixtures, such as to apply to the skin. The aluminum-plated screw-top lids are designed to prevent air from getting to the oils and mixtures in an attractive gold color. The bottles are amber-colored to protect against the light. The small containers are tall enough to apply a homemade label, so you know what is in the container or to make the bottle look professional to give as a gift or to sell your own mixtures. Did you enjoy this list? Sharing the best products to use with your essential oils ensures that you can use them the way you want and need. Share your thoughts in the comments and send this article to your oil-loving friends!